The Modernist Glockenspiel is part of a series of instruments aimed at providing beautiful simple interfaces that match beautiful, simple, and useful audio sampling. We have carfully sampled our Glock, with a classic articulation and then added three additional sample sets that use innovative different approaches to playing the instrument: rubber mallets, felt-covered mallets and brushes. We've included an innovative approach to delay, using our micro-dealy engine, to allow easy development of trilled, and sustained sounds and added a warmth and colour controls to allow colouration of the final output. Finally we added two convolution reverbs dedicaed to room spaces to place the instrument in a relaistic environment. The Modernist Glockenspiel comes with 20 snapshots to get you started. 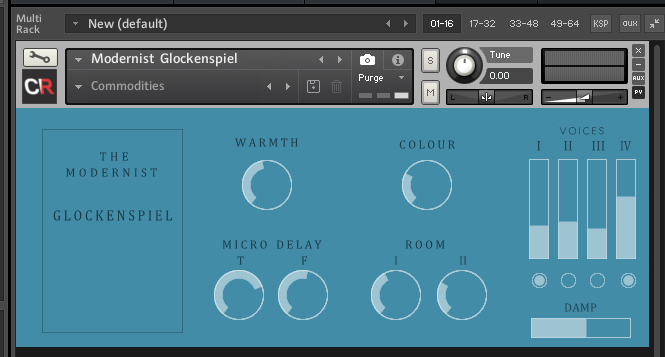 The Modernist Glockenspiel requires the full version of Kontakt 5.8.1 or above.